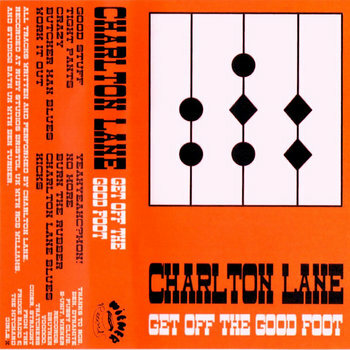 Charlto n Lane is an artist based in South West UK and is set to release the ten track album Get Off The Good Foot on the 23rd March 2015 through Weiner/Burger Records, iTunes and also Bandcamp. There are only one hundred copies available on a high bias, high quality cassette which comes with unlimited streaming via the free Bandcamp App plus high quality downloads in various formats. This great release is a highly enjoyable listen as it combines an electro pop style back beat overlaid with traditional rock’n’roll style guitar and vox. Charlton describes his style as electro kraut blues so this combination of descriptions should give you a fair idea of what to expect. During 2014 Charlton Lane released the singles “Butcher Man Blues” and “Good Stuff”. Both of these superb tracks are in the album Get Off The Good Foot, which is a highly enjoyable and addictive listen. “Good Stuff” starts the album and hooks you in as it gets your feet tapping sweetly before you slip into “Tight Pants”. This leads onto ‘Crazy’ which adds a sweet fever to the Tracklist. “Butcher Man Blues’ slows the pace slightly while adding more of a blues element to this album. I can assure you that this track, just like all of the tracks but especially this one is a very passionate track which comes straight from the heart. “Work It Out” is another very bluesy number which leads to “Yeah Yeah C’mon” which is far more electro kraut rock’n’roll. “No More” is a slightly melancholic number which leads into “Burn The Rubber”. As the title implies this track picks up the pace very nicely once again and leads onto “Charlton Lane Blues”. This bluesy number slows the pace whilst adding some harmonica into the mix just before the final track “Get Your Kicks (On The A46)” starts up. This tune is a smoulderingly good track which, in a respectful ‘tongue in cheek’ fashion is very reminiscent of the Stones track.